Not as funny as they think! 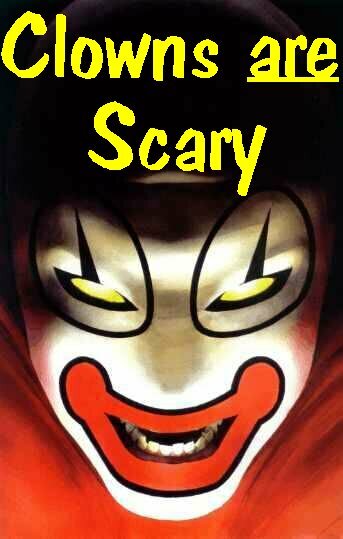 Clowns are not funny - they are evil and should be destroyed. They spread fear and custard wherever they go, sending sane people into a frenzy of hatred. If you see a clown - please punch him in the face and ask him if he thinks it's funny. Then kick him in the nuts - then take a photo and send it to me. Get it out of your system - click here and kill a clown. At the tender age of five, I was delighted to discover my school had arranged a trip to the circus. We boarded the coach, chattering excitedly and rushed to get the best seats. As the coach trundled to its happy destination a car suddenley pulled out of a side road forcing the coach to swerve and hit another vehicle. I was thrown from my seat behind the driver and hit my head on a fire extinquisher, knocking me unconcious. As luck would have it I was the only child injured, and the coach was undamged, so we continued to our cheery destination. By the time we reached the circus I had regained conciousness, but was suffering from concussion and double vision - causing me to throw up about once every 5 minutes. Not wanting to spoil the trip for everyone else my teachers decided that I would be ok and didn't need to go to hospital. The only thing I remeber clearly from the whole show is horribly distorted clown faces looming up at me with thier stupid red noses. Since then I have hated the sight of clowns.